Ah, the on-going joys of defining “pagan”. I haven’t read all the recent commentary, but I have spent some time reading through linked blogs from The Wild Hunt on the topic. There are those who focus on definitions. What is paganism? Who is included? Can we even reach a definition? Peter Dybing warns of the dangers of sliding back into the Witch Wars of yesteryear. Much of the commentary seems to focus on the importance of being inclusive in our community. Or in other words, for the love of any god, please don’t turn this discussion into another reason to fight amongst ourselves because when we do that, none of us win. The debate over the meaning of pagan is not a new one and not surprising. We’re using a single word to try and capture western magical traditions as well as religious and spiritual practices that are largely (though not exclusively) European based (whether inspired or reconstructed, I do not care). And then, that poor little word, has to take on all “earth-based” religions (though thankfully they’re pretty much already included in my list) PLUS anyone who doesn’t identify with a specific practice in the above but feels comfortable in the pagan grouping. It only has five letters, that poor little word. It’s a very flexible word, letting us bend it however we wish, but somedays it and we feel the strain. So why the big flare up of this old discussion? Because there’s a group that we would normally assume would be with us under the pagan umbrella who don’t see themselves that way. Drew Jacob explains there why he and those in his Temple don’t consider themselves pagan. I wonder if the upsurge in commentary is based upon fear? Fear that if every group and individual who sees their practice as something separate and distinct from the idea of ‘pagan’ were to leave there would be no pagan community left. Which is a fair concern given that probably 98% of the pagan community are not ‘practicing pagans’. Hel, what would a practicing pagan even be? They usually, in my experience, are the earth worshipping casual practitioners-of-nothing-in-particular. There’s not many of them, but they are usually nice people. Most of us define ourselves in a particular faith (Druid, Asatru, Heathen, Wiccan, Thelemite, a unique label that works for us that no one else understands, etc, etc, etc) based on what we do and believe, but accept the pagan label for outside convenience and for inner community. By agreeing that pagan is a label we can apply to all of us gives us the perfect excuse to spend time, learning and celebration with relatively like-minded individuals. Take that away and it becomes harder to sit around that communal fire with each other that T Thorn Coyle mentions on the Wild Hunt blog. For me personally, I will not force Drew Jacob’s group to be part of paganism. That’s their choice. However, his arguments for why they are not pagan did not persuade me. One argument was that their method of practice was not well understood or comfortable for the pagans who took part in it; all you have to do is watch any relatively homogenous pagan group attend an event thrown by a different type of practicing pagan group and you’ll see the same thing. We all get a little discomfited when we experience something that is new and different. This does not make the new experience not-pagan, just not-familiar. He also lists a number of specifics that his group does not do that he sees as typically pagan (though he also says that list is but a sampling). To which I say, try working around Thelemites and Hermetics and those notions of four elements, 8 sabbats, working in circles get a sound thrashing. Not in a ‘they are bad’ way, but in a ‘we don’t do that’ way. ADF druidry doesn’t do circles either and they only reason we stood around in that shape was due to the convenience of speaking and seeing each other. In other words, pagan is a broad descriptive bucket term. And just as any material in a bucket is not the bucket itself, we don’t practice ‘paganism’, we all practice different things that can be, conveniently or not, shoved into the very accommodating bucket of pagan. The more I type, the more I believe that this reaction from the pagan community arises from a subtle feeling of being threatened. And the urge to bond closer together is a natural and healthy response to that. In the end, one group wanting to disassociate themselves from the pagan bucket will make no difference to the rest of us. The attempt to define ‘pagan’ will continue like waves of the tide. And we will get together when and where we can to celebrate life. It is our actions that define us and how others see us. And my next action is to get a cup of tea. Tense moments always go down better with tea. So, yesterday was a Bad Day. They happen. But alas, philisophical equanimity rarely happens during Bad Days. No, the Bad rules us, tearing us down, making us bitchy and cranky and ready to spew all of our anger into the perfect vessel: hockey. For those who missed it, or don’t care and so need the briefest reminder to understand the rest of this post, last night the Canucks (that would be Vancouver’s hockey team) won the Western Conference finals. What that really means is that we’re now going to be in the Finals for the Stanley Cup. That’s four wins until it’s ours for the first time. WOOHOO!! And last night was an absolutely freakingly marvelous game. So I worked out some of my aggression last night via hockey. But still was in a semi-bad mood today that was aggravated by coming down with some kind of bug (yes, I feel physically crappy right now). I checked my mailbox (the physical one at work) and in it was an envelope. I opened it and found a note from a co-worker, the one who had the fortune to be at Rogers Arena for the big game last night. We’d been talking about hockey fandom and my desire for a jersey yesterday. She hoped I’d enjoy a couple small souvenirs. In the envelope was a poster/waybill from the event and a souvenir towel that was used at the game (we have this towel power tradition, where we wave white towels over our heads in celebration, usually of goals, see it in action on youtube). Putting aside the wonderful mojo of that towel (it really was an intense game and a significant one), the power of the gift hit me with a heart-splitting sledgehammer. It wasn’t expected. This co-worker and I are friendly to each other, but not close in any sense. So there was not even a hint of this gift possibility in my worldview. It was a surprise, freely given, and damn near made me cry from the joy of it. Her small gift changed my day. I’m still sick, and still moody over a couple of things, but the balance has shifted and the world has a rosy, if overly hot, headachy, and nauseous glow. Thank you, lovely lady, for making my day. There was a time, many years ago, when I was young, my body unbreakable and there was no such thing as the internet, that it was relatively easy to scare the muggles. See, even that has changed. Back in the day we called them mundanes or cowans. Now popular culture has infected us, not the other way around, and the non-pagans of the world are now muggles. Back when, it didn’t take much to spook these people. A little mention of magic here, a little spellcasting mutter there, and suddenly that seat on the bus was all yours. You could make room in lineups at the movie theatre, get the last bottle of booze on the shelf…okay, that’s probably stretching it, but the idea is still there. We were unknown, mysterious, creepy. And there was no point in going into the differences between types of pagans. Who would understand? There I was, in the grocery line, buying a used copy of Skeleton Key (ask Cory & Laine at New World Witchery for all the hoodoo details that are in it) and frozen pizza and I end up chatting with the guy in line behind me about the movie. Now being me, I couldn’t bring myself to refer to the practice in it as Voodoo when I’m pretty darn sure it’s Hoodoo. Sure, it’s a teeny detail that wouldn’t matter to a muggle, but still, I felt the need to be precise in my statement. It’s possible he misheard me, but I don’t think so, and he didn’t blink at all over the word usage and he understood what I was talking about. In fact, he joked about having never tried that [hoodoo]. I suggested everything should be tried at least once in life. He agreed. And then we both acknowledged that the conversation had travelled to an odd place. I think I miss scaring random strangers. Hello! Yes, I feel very excited about sending out a greeting. Perhaps I spent too much time on my own these past several days. Perhaps? Okay, fine, I obviously did. Further evidenced by this arguing of my multiple personalities. Right, back to the blog post. 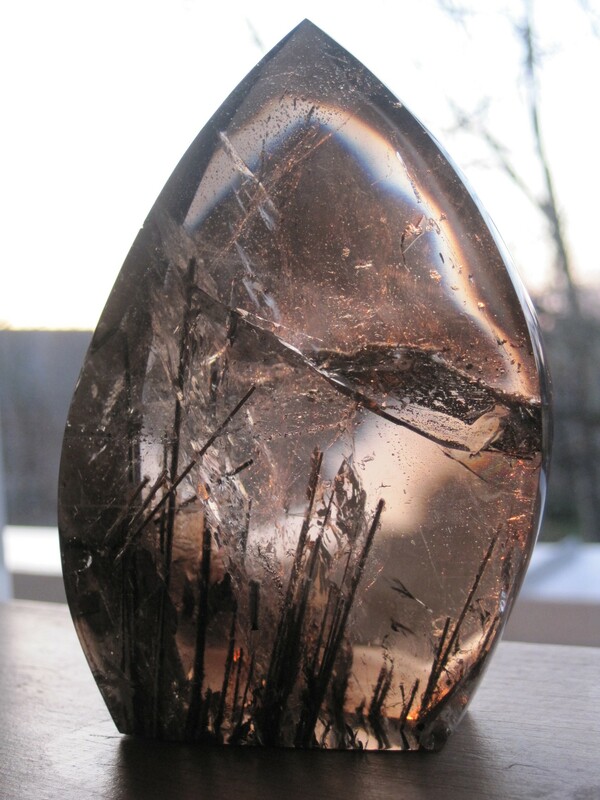 This is a rutilated smoky quartz, I believe. The inclusions at the bottom strongly resemble reeds in a marsh and the flaw (or whatever the proper term is for the plane of visible crystal) about a third down from the top can resemble a dragonfly hovering over the reeds. The piece has been cut and polished from its natural state and is about 4 inches high. Magically it would be easy to work with this piece for connecting with or working with some aspect of marshes, the quiet, the life-filled land, liminal boundaries, fecundity. I haven’t worked with it magically as of this time but I have it in my living room window and look at it on a very regular, enjoyable basis. This Stoner Report has been brought to you in part by the wonderful selecting abilities of Stone Haven Gems, which is where I purchased it.